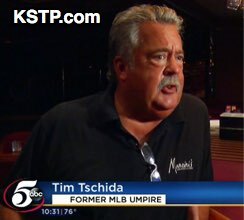 Retired MLB umpire Tim Tschida is now a bartender in St. Paul, Minnesota, granting an interview to local affiliate KSTP from the bar he tends at. From Mark and John Hirschbeck's Sport Bar & Grille to Doug Eddings' former Ump 88 Grill, there's something about the restaurant business that draws umpires—maybe because umps spend so much time on the road in bars. Retired ump Tim Tschida now tends bar. Local news outlet KSTP caught up with Tschida, who spends part of his time as a bartender at Mancini's Char House and explained that he bartended throughout college and during his minor league career as his offseason and baseball vacation job in his hometown of St. Paul. When it comes to reminiscing about pro ball, it isn't the spotlight and certainly not the travel that Tschida speaks fondly of: "I miss the guys, I miss the umpires, I miss the camaraderie...and the locker room banter and all that sort of thing and I miss the action on the field to a certain degree." And if you happen to stroll into Mancini's when Tschida is behind the bar during the day, there's a chance you'll hear a good old fashioned story, such as his 1987 ejection of Twins pitcher Joe Niekro after umpires discovered an illegal emory board on Niekro's person during a mound inspection: "We didn't really want to eject him, we didn't want to embarrass him. We didn't want to do anything like that. I was hoping to get by with just an inspection and then say alright, clean it up from here on out." Talk about ample material for a bartender, and as reporter Tom Hauser found out, Tschida has only had one ejection, thus far, at Mancini's: "Just one, he had been over-served before he got here." Tschida had 85 ejections at the big league level through 3,358 career AL and MLB games.